There have been lots of exciting things taking place in school this week. 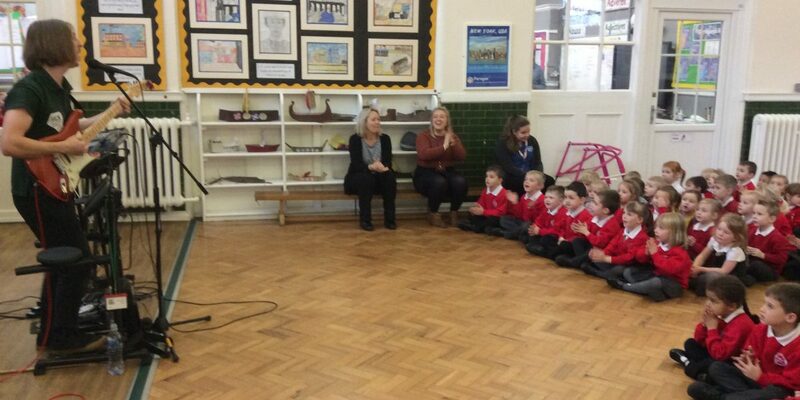 On Wednesday, the children were treated to an extra-special assembly, provided by ‘Rocksteady’ Music School, who provided a musical demonstration to encourage pupils to consider learning to play a musical instrument, take up singing and to join a school band. All of the children were singing and joining in – I’m sure you have heard lots about the assembly already. ‘Rocksteady’ is a great opportunity to make music inclusive, so that all pupils can take part in music, and to offer new and exciting curriculum opportunities. We hope to be able to share more details about this in the near future. It’s always a pleasure to be able to share the fantastic learning that takes place in school each week and it always puts a smile on my face when a child shows such pride when sharing their learning with me. I have seen some superb Paragon projects, including ‘dream boards’ in Year 2, and incredible Maths, with pupils in Year 4 enjoying their challenges on ‘time’. Children in Reception have been helping ‘Supertato’ to save the vegetables from the ‘Evil Pea’ and have been practising their writing and phonics sounds. We hope you have enjoyed visiting the ‘Book Fair’ this week – there have been some new books on display and the favourite accessories too, and some fantastic deals and offers. A particular ‘Thank you’ to Mrs Timms who has helped run the Book Fair this week. Today we say ‘Goodbye’ to Mrs Hickson, our school-crossing supervisor, who has decided to hang up her ‘lollipop’. Mrs Hickson has been patrolling the crossing, keeping all of the children and their families, who cross the busy Down Road, safe for the past 13 years. In that time, she has made great relationships with so many of you and I know that you are grateful for the care and professionalism she has provided in this time and will be sad to say ‘Goodbye’. This has not been an easy decision for Mrs Hickson but she feels that it is now the right time to stop, so that she can spend more time with her family. She will patrol the crossing for the last time this afternoon (Friday). This will mean that for the next few days the crossing will be unmanned. We have spoken with East Sussex County Council who are aware of this. Please can I ask you to take extra care if you are crossing here. If you drive down Down Road, do so with care and consideration for children and their families. Thank you. Lilly-Mae P and Millie P in YR.
Romey B and Riley S in Y1. Brooke G and Alfred H in Y2. Bella N, Chloe H and Harry D in Year 3. Samer S and Roxie O in Y4. Lexie B and Kingsley F in Y5. Lilli-Mai B and Emma L in Y6. The number ’49’ was chosen in the ‘Attendance Raffle’. This week’s ‘Champion’ is Taylor B. in Year 5.